The classic. So good all you basically need is a spoon. It is summer in a sauce, especially since it’s no cook! 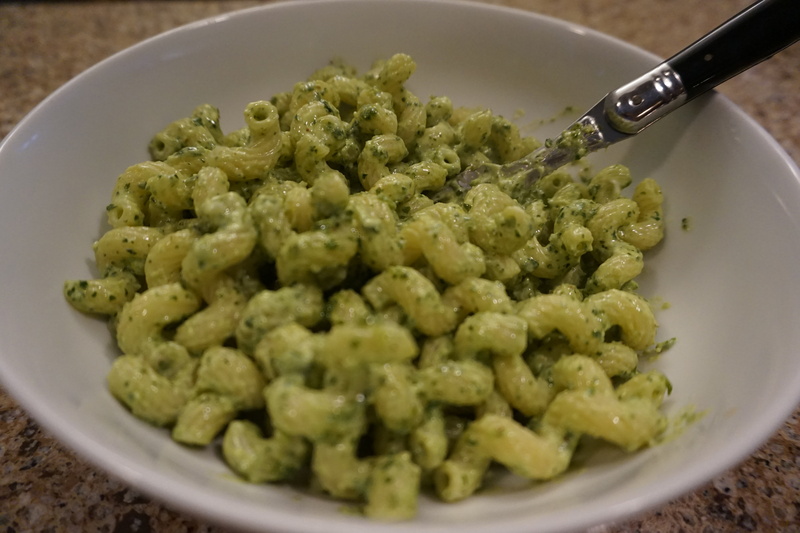 I realized I had posted different pesto variations but never the classic basil. I have tried lots of different versions over the years and finally worked out my own that borrows from all the rest. Most pestos will only use pine nuts but I like a mix and by happy accident tried it with pecans once (out of walnuts) and really liked the flavor. A little lemon zest is also nice here to really amp up the lemony flavor of basil. This is my base recipe – it doesn’t contain any cheese so it’s perfect to freeze or for vegans. 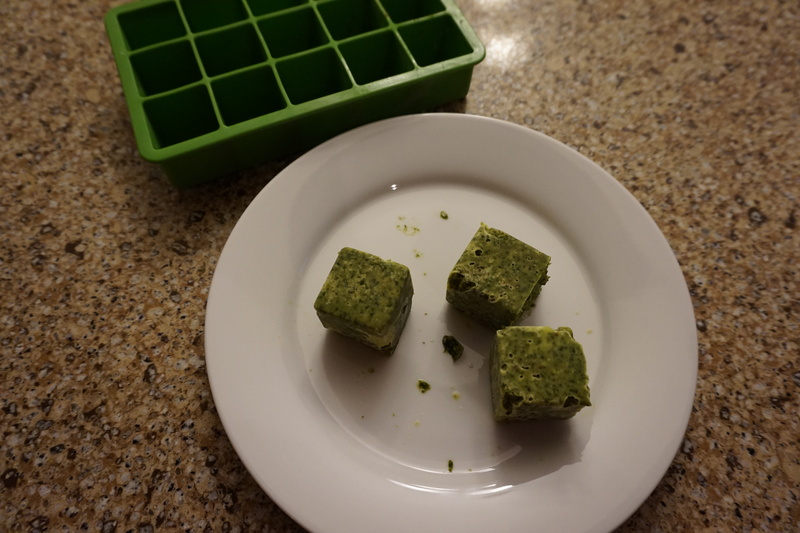 I like to freeze the pesto in ice-cube trays or mini muffin pans (silicone is the easiest to get them out) and then just defrost and let my imagination run wild. If I want to stay true to the classic I just fold in grated parmesan but often I skip the parm and mix in goat cheese which really mellows out the garlic and makes a wonderfully creamy sauce. 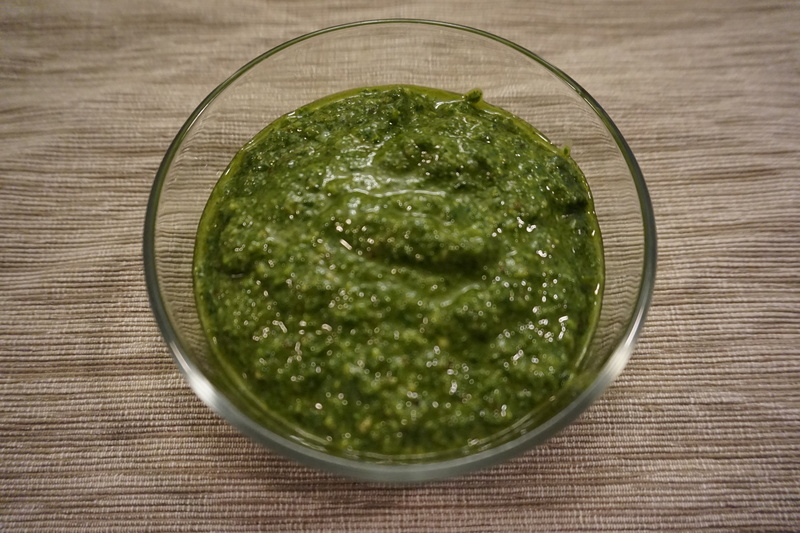 Honestly anyway you cut it this is a great sauce – perfect with pasta or even on top of grilled chicken or as a dip for veggies. Make a whole bunch with the rest of your summer basil and freeze it so you can have a little bit of summer this winter. In a food processor add the pine nuts, walnuts and garlic cloves. Process until chopped together. Add the basil, lemon zest, and salt and pepper. Process again for a couple of seconds and then with the food processor running pour in the olive oil until it comes together as a pesto. This can now be served on its own or mixed with cheese, kept for several days in the fridge under a layer of olive oil or frozen for several months. In a food processor add the pine nuts, walnuts and garlic cloves. Process until chopped together. Add the basil, lemon zest, and salt and pepper. Process again for a couple of seconds and then with the food processor running pour in the olive oil until it comes together as a pesto. This can now be served mixed with cheese or on its own, kept for several days in the fridge under a layer of olive oil or frozen for several months.